The AC Adapter has a 10-foot long cord, so it should accommodate most outlet configurations in the home. The RT-2 room transmitter radiates a 360ª signal up to 8 feet. The RT-2 room transmitter is available in two frequencies. It has non-encoded or encoded mode settings. When the RT-2 room transmitter is set in the encoded mode, an ID code makes the system immune to all interference from stray signals and provides “DUAL ZONES”, in the signal field. The dual zone establishes two signal fields. In the first signal field, the pet receives a warning level stimulus that has been preset on the front of the RT-2 room transmitter. Its purpose is to warn the pet to turn back. Should the pet enter the second signal field, the receiver will automatically increase to a stronger stimulus. 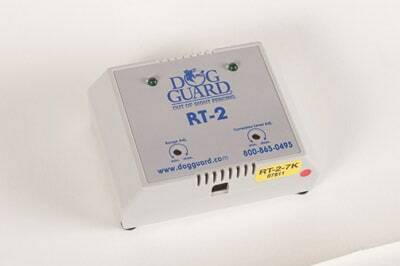 The RT-2 room transmitter is a great way to keep pets off countertops, furniture, out of special rooms or out of the garbage! RT-2 room transmitter has a LIFE TIME warranty. The CORRECTION LEVEL ADJUSTMENT works only in the encoded mode. There are 32 levels of stimulation to choose from. This will set the amount of stimulation the pet will receive in the first signal field.